.Apply A Few Drops Of Nail Glue On Finished Manicure And Place The Rhinestone On The Desired Area, Or Bring Them Along To Your Favorite Nail Tech During The Next Appointment! Fit The Surface Of Your Nails.Some Of Them Are Small ,It Are Fit To Short Nail,But Some Of Rhinestone Fits Perfectly On All Lengths Of Nails . 12 Jars are Included Different Materials for Your Fingernail Crystal Decoration. About 56 Different Shaped Designs Materials for Nail Decorations.They are Drop,Diamond,Star,Rectang,Rhombus,Triangle,Marquise,Trapezoid Flatback AB Glass Rhinestones, Rainbow Heart butterfly flat glass charms and Mirro gem jewelry. 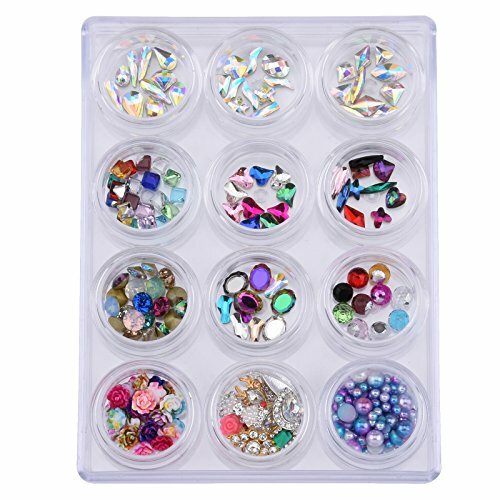 70pcs Flat Back Glass Rhinestones+30pcs Resin Flowers + 10pcs Nail Charms + 136pcs Mermaid Nailart Pearls. 20pcs Mixed Pointed Rhinestones + 20pcs Square Rhinestones. They are for Glitter Nail Decor,Manicure Salon,DIY,Scrapbooking Arts. If you have any questions about this product by TEEKME, contact us by completing and submitting the form below. If you are looking for a specif part number, please include it with your message.